I believe the Holy Spirit has been forgotten. I’m not joking. “From my perspective, the Holy Spirit is tragically neglected and, for all practical purposes, forgotten.” (Forgotten God, Francis Chan with Danae Yankoski. 2009 by Francis Chan) I know you wouldn’t dare deny His existence, but I’m willing to bet that there are millions of church-goers (and maybe even you) who cannot say confidently that they have experienced His presence or action in their lives over the past year. That is a tragedy. One of the greatest problems in presenting our faith to people and especially in preaching is overemphasis and under-emphasis. In other words, placing too much importance on one issue and not enough importance on another. Balance is essential. I am not saying that the there should be more emphasis on the Holy Spirit and less on other important issues, but I am saying that He is clearly being tragically neglected. My focus through this message is to explain the person and work of the Holy Spirit and to show one of the most significant ways we are respond to Him. I hope that within however long we are here in this meeting together, that we will allow God to reverse our tragic neglect of the Spirit. Without Him, people work, think, plan and operate in their own strength and only accomplish human-size results. But when believers operate through the power of the Spirit, the evidence in their lives is supernatural. Only when we work through His strength will we accomplish God-sized results. “16 But I say, walk by the Spirit, and you will not gratify the desires of the flesh. 17 For the desires of the flesh are against the Spirit, and the desires of the Spirit are against the flesh, for these are opposed to each other, to keep you from doing the things you want to do. 18 But if you are led by the Spirit, you are not under the law. 19 Now the works of the flesh are evident: sexual immorality, impurity, sensuality, 20 idolatry, sorcery, enmity, strife, jealousy, fits of anger, rivalries, dissensions, divisions, 21 envy, drunkenness, orgies, and things like these. I warn you, as I warned you before, that those who do such things will not inherit the kingdom of God. 22 But the fruit of the Spirit is love, joy, peace, patience, kindness, goodness, faithfulness, 23 gentleness, self-control; against such things there is no law. 24 And those who belong to Christ Jesus have crucified the flesh with its passions and desires. It is always important and necessary to look at a few facts about the entire letter before we dig into this specific text. Why is that? Because Galatians (like the rest of the Bible) was written in another language, in another culture, in another time, to another people. Before Galatians has meaning for us, it had meaning for someone specific. When we discover these facts, great insights are made available to us and we can then properly grasp the meaning of this text. So who was the author? The Apostle Paul. He was originally writing to the churches in southern Galatia, founded on Paul’s first missionary journey. This church was a problem church. It isn’t like the church “in Ephesus” (Ephesians 1:1) or “at Philippi” (Philippians 1:1). When Paul was writing to those two churches (at different times) he doesn’t mention any heresy that he is trying to confront and doesn’t call out any problem within the churches. But as for the Galatians, a crisis has hit the church. The church came into being as a result of God’s Spirit at work in Paul’s proclamation of the gospel (3:1-5; 4:13-15). But within the short space of time since Paul left (1:6), the church has been visited by false teachers whom Paul calls those “who trouble you” (1:7) or “those who unsettle you” (5:12). And Paul was writing to refute these false teachers called “Judaizers.” The Judaizers basically taught that Gentile believers must obey the Jewish law in order to be saved. Paul also was writing to call Christians to faith and freedom in Christ. This passage that we are looking at isn’t the first mentioning of the Holy Spirit in the letter to the Galatians (3:2, 14; 4:6), but it is Paul’s declaration to live by the Spirit’s power. However, I think it is important to get a firm grasp on who the Holy Spirit is, what He does, and what He is like before we see how we can respond to Him by keeping “in step with the Spirit” (5:25). Now before we begin to grasp the Holy Spirit, it is important to make sure you have a clear understanding of what the Bible teaches about the Trinity. I have heard all of the popular descriptions of the Trinity. The egg: the shell, the white stuff, and the yolk. I have heard about the three forms of H2O (water, ice, and steam). While these serve as simple metaphors for an unexplainable mystery, the fact is that God is not like an egg, or three forms of water. God is not like anything. He is incomprehensible, incomparable, and unlike any other being. “He is outside our realm of existence and, thus, outside our ability to categorize Him” (Forgotten God, Chan with Yankoski. p.66). Two concepts that will help you grasp the Trinity are the Incomprehensibility of God and the Knowability of God. You might think I am riding on a hobby horse right now and you may be right. But I hope to clear up any misconceptions you may have about the Holy Spirit and the only proper way to do that is to correctly define the Trinity, and to correctly define the Trinity (carefully and biblically) we must first examine certain concepts that will help in our understanding of this great doctrine. I am not attempting to completely explain the Trinity; the church in times past has been severely embarrassed due to oversimplifying something that cannot be oversimplified! The more you know God, the more you want to know God. And in the quest to know God, it is vital to understand just what it means to really know Him. Methods, expectations, and attitudes in studying theology are determined by one’s definition of “knowing God.” Central to understanding this is the fact that God is both incomprehensible and knowable. What are the implications of God’s incomprehensibility? Well, because God can never be fully known, those who seek to know God should be deeply humbled in the process, realizing that they will always have more to learn. The appropriate response to God is a heart of wonder and awe in light of His incomprehensible greatness! God’s incomprehensibility also means that beliefs can be held with firm conviction even though they may be filled with inexplicable mystery. The Trinity and other core teachings of the Bible are profoundly mysterious; believing them requires that you have a robust affirmation of the incomprehensibility of God. Now rest a moment and take all of that in. The incomprehensibility of God could lead to despair or apathy in the quest to know God, but the Bible also teaches that God is knowable. While God can never be exhaustively understood, He can be known truly, personally, and sufficiently. God is personal, has definite characteristics, and has personally revealed Himself so that He can be truly known. The multiplication of grace and peace in our lives is dependent on knowing God (2 Peter 1:2-3), and this knowledge provides sufficient resources for life and for becoming the people God wants us to be. Knowledge of God in Christ should be our greatest delight (Jeremiah 9:23-24; 1 Cor. 2:2; Gal. 6:14). It is the basis of attaining eternal life (John 17:3); it is at the heart of life in the new covenant (Heb. 8:11-12); it was Paul’s primary goal (Phil. 3:10); and it leads to godly love (1 John 4:7-8). God will never be known absolutely, but we can know things about Him that are absolutely true, so much that we can be willing to live and die for those beliefs. God has provided knowledge of Himself that is personal, relational, and sufficient for fruitful, faithful, godly living. No one will ever be able to say He lacked the necessary revelation to know God and to start living as God intends. What are the implications of the knowability of God? Well, God’s personal and sufficient revelation of Himself should foster solid conviction among believers. We need not to live in ambiguity and uncertainty about who God is and what He demands of His creatures. This increasing influence of Eastern religions on the West, certain postmodern views of truth, and religious pluralism all emphasize God’s incomprehensibility so much that He is eventually made to seem unknowable. It then becomes impossible to say anything definitively true or false about Him, and people then think that the only heresy is claiming that there is heresy at all! On the contrary, because of His gracious revelation and illumination, God can indeed be known. God’s knowability should lead to eager, diligent, devoted study of God’s Word so we can understand Him as He has revealed Himself and avoid any false view of God that will dishonor Him. We should never grow apathetic in seeking to know God because we are in fact able and equipped to know Him and please Him with our lives. There is one and only one true and living God. This one God eternally exists in three persons–God the Father, God the Son, and God the Holy Spirit. These three persons are completely equal in attributes, each with the same divine nature. 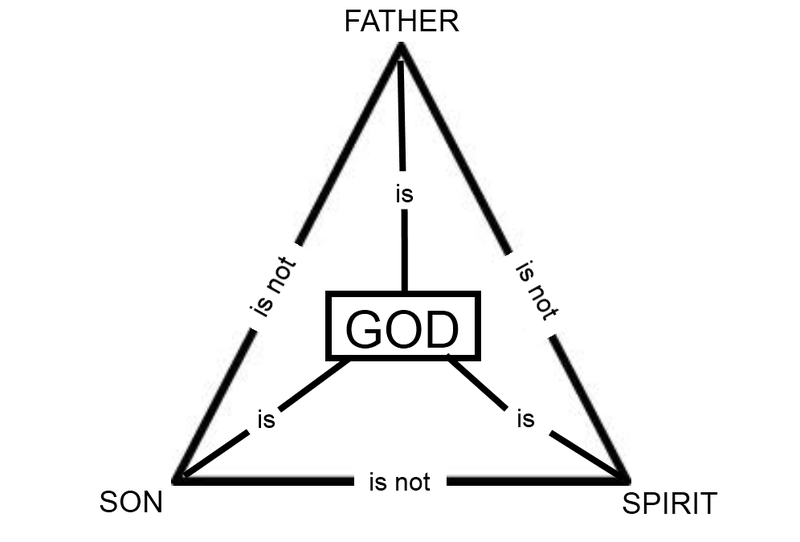 Scripture attests to the Trinity. Look at Matthew 3 where Jesus was baptized. You have the [God the] Son, Jesus, being baptized. You also have the Spirit “descending like a dove and coming to rest on him” (Matt. 3:16b) and the Father saying from heaven, “This is my beloved Son, in whom I am well pleased” (v. 17). Look at the formula for baptism in Matthew 28 when Jesus gives the Great Commission. And there are many other Scriptures (Deut. 6:4; 2 Cor. 13:14; John 14-16). Here’s the bottom line: the doctrine of the Trinity is well beyond human ability to ever fully comprehend. However, it is central to understanding the nature of God and the central events in the history of salvation, in which God is seen acting as, in effect, a tripersonal team. Biblical Christianity stands or falls with this doctrine. The Holy Spirit is a fully and completely divine person who possesses all of the divine attributes. God the Spirit applies the work of God the Son. The Spirit’s distinct role is to accomplish the unified will of the Father and the Son and to be in personal relationship with both of them. The Spirit comforts (John 12:26; 14:16, 26; 15:26; 16:7). The Spirit teaches (John 14:26; 1 Cor. 2:13). The Spirit speaks (Acts 8:29; 13:2). The Spirit makes decisions (Acts 15:28). The Spirit grieves over sin (Eph. 4:30). The Spirit overrules human actions (Acts 16:6-7). The Spirit searches the deep things of God and knows the thoughts of God (1 Cor. 2:10-11). The Spirit determines the distribution of spiritual gifts (1 Cor. 12:11). The Spirit interprets and brings human prayer before the throne of the Father (Rom. 8:26-27). The Spirit assures believers of their adoption (Rom. 8:16). The Spirit bears witness to and glorifies Christ (John 15:26; 16:14). The Holy Spirit is eternal (Hebrews 9:14). He is omnipresent (Psalm 139:7-10). He is omniscient (1 Cor. 2:10-11). The Holy Spirit is omnipotent (Luke 1:35-37) and He is holy (Rom. 1:4). Now that you hopefully have a grasp on the Holy Spirit, how are you to respond to Him? Our text in Galatians tells us of one significantly important way to do so. “But I say, walk by the Spirit, and you will not gratify the desires of the flesh.” (5:16) The only way to conquer the flesh is to yield to the Spirit. Walk by the Spirit implies both direction and empowerment; that is, making decisions and choices according to the Holy Spirit’s guidance, and acting with the spiritual power that the Spirit supplies. To “walk” in Scripture regularly represents the pattern of conduct of all of one’s life. “For the desires of the flesh are against the Spirit, and the desires of the Spirit are against the flesh, for these are opposed to each other, to keep you from doing the things you want to do.” (v. 17) Paul acknowledges that the Christian life is a struggle–a war between the flesh and the Spirit. He describes two forces at work within us–the Holy Spirit and our evil inclinations (the flesh). Paul is not saying that these forces are equal. The Holy Spirit is infinitely stronger, but we are weak. If we rely on our own wisdom, we will make wrong choices. If we try to walk to in the Spirit by our own human effort, we will fail. Our only way to freedom from our natural evil desires is through the empowering of the Spirit. Now let me give you a bold warning: This “walking in the Spirit” thing will cause you to make some serious changes in your life. You’re going to have to turn off that TV and open your Bibles. You’re going to have to walk away from that argument and get in your closet and pray. You’re going to have to shut off that computer, get off of Facebook, and study your Bibles. You’re going to have to get up an hour earlier to pray in the morning before you rush off to work. I’m not against any of the activities that we consider “normal” in our generation today, but if we want God to do something big in our lives, we’re going to have to submit to Him more than we do now. You won’t get anywhere with God without submission. The problem is that most of us are okay with Jesus doing some touch-ups in our lives, but He wants to completely transform us. Anything that is in your way of fully surrendering to the Spirit and walking in Him, you need to abandon it. Recklessly abandon anything that may hinder you from allowing God to do all that He has purposed to do through you. Looking at Galatians 5:16-26 we can clearly assume this fact: what you feed will live and what you starve will die. Feed the life of submission and allow God working-room within you and Christ-like characteristics will flow through you (vv. 22, 23). Starve sin and “walk in the Spirit, and you will not gratify the desires of the flesh.” (v. 16). Feed the life of rebellion and sin and your light will be hidden under a bushel (Matthew 5:15). Now a few books earlier in the New Testament, we have the book of Acts. It is all about what God can do through Spirit-filled believers. Read through it sometime and just drink in every word. My prayer is that your changed life would produce this kind of astonishment: “Now when they saw the boldness of Peter and John, and perceived that they were uneducated, common men, they were astonished. And they recognized that they had been with Jesus” (Acts 4:13 ESV, emphasis mine).